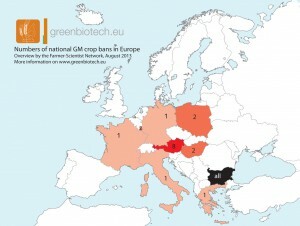 In all countries of the survey there are farmers who wish to have the freedom to use the crops they find best suited for their needs, including approved GM crops. Modern biotechnology can contribute significantly to addressing these challenges, because it can help overcome some limitations of conventional breeding. By 2050 farmers need to produce 70% more food with less impact on the environment and on less land. In a letter to MEPs of the Agricultural and Environmental Committee of the European Parliament and to Ministers of Agriculture various FSN participant organisations ask their support to reject the proposal that EU Member States can restrict or prohibit the use of approved GM food and feed on their territory and urge the EU institutions to return to freedom of choice of farmers and to science as the basis of decision making. Various organisations participating in the FSN ask new MEPs their commitment to help restoring innovation and sound science as the basis for policies, regulations and decision making dealing with farming, including those related to the use of genetically modified crops. We write to you on behalf of the European farmers’ organisations listed below and the Public Research and Regulation Initiative (PRRI). The farmers’ organisations below support the freedom of farmers to choose the crop varieties, including approved genetically modified (GM) varieties, they find best suited to address the increasing and changing challenges in farming. In light of the improvements that access to GM crops can bring to EU farmers, various organisations participating in the FSN ask MEPs to reject the draft motion for a resolution against GM maize 1507, and to send a signal that the EU is still open to innovative products that have been proven as safe as conventional products by the European Food Safety Authority.